It was happening again. No matter how hard I tried to avoid it, change it, deter the circumstances from occurring, it was happening again. They were going to ask THAT question, the one that I had smiled and shrugged my shoulders at so often throughout my life, the same inquiry you get from friends, family members, neighbors, coworkers, teachers, the grocery store clerk, your mailman, strangers on the street and visiting aliens from outer space: "Why are you single?" Even Facebook, that beloved social network/big brother, asks our status. "Single"; thanks for pointing that out, Mark Zuckerberg. It's a question that has no great answer. We may say, "Oh, I'm focusing on me (or my family or career or education) right now", but even those are not satisfying responses for others (plus, President Spencer W. Kimball was pretty direct about marriage-avoiding rationalizations). Others may smile and nod, yet the look in their eyes belies continued concern, as if we may actually be "menaces to society". It's as if our single-hood is a problem to be solved, a disease to be cured. In all seriousness, these loving parties usually ask because they care and want us to be happy and we should demonstrate gratitude and humility for their desires to see us blessed with love. Yes, we can live a happy, productive, and satisfying life as singles. And yet, not a week passes that I do not hear about midsingles' plights when it comes to dating and relationships (or think of my own). There are tears, anger, frustration, disappointment, discouragement, plenty of wisecracks, some depression and far too often a resignation to living the single life because "dating is too hard" and "I'll never get married (or re-married)." So yes, we throw ourselves into careers, educations, service projects, the kids, talents, hobbies, and so on. We tell ourselves that we are doing OK because we still attend the midsingle wards and trips, the cruises or the dances, not to mention the fantastic conferences; we like the "fun" stuff of our single-life culture, but if we were being truly honest with ourselves, they may be good activities we partake in without really wanting the potentially-there solution to our single status. As my friend who visited from out of town asked at a recent midsingles activity, "How are all the beautiful and handsome people not married? My ward has sixty people. This valley has thousands of potential dates for them to pick from." We enjoy our incredible friendships and the good memories we share along the way, but my friend was hinting at a hidden truth that many singles do not want to look at: we could be avoiding the level of dating that has the specific intention of finding someone to marry. We play the game without a committed desire for the game to end, like neighborhood kids playing ball on Summer's last night before school starts. LDS Audio Fireside "Gold Medal Missionaries: Preparing to Serve as a Champion of the Lord"
As an American bobsled competitor and returned missionary for The Church of Jesus Christ of Latter-day Saints, beloved speaker Jeremy C. Holm understands what it takes to serve as a Champion of the Lord in His service. In this inspiring and motivating audio fireside talk, Jeremy utilizes his on-ice experiences and insights from the scriptures to coach future missionaries on how they can confidently reach their highest potential through obedience, study, service, faith, humility, and continual effort. “The youth of the Church constantly amaze me with their spiritual insights and the strength of their testimonies. The Lord truly has held some of his most powerful champions in reserve to come forth in this time to take His work forward. Their hearts are willing, their spirits are ready. 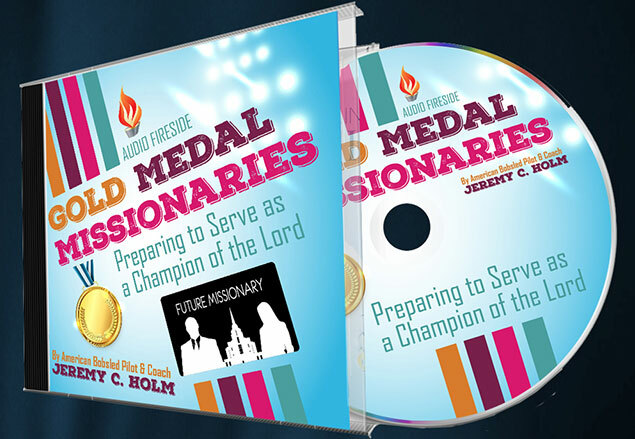 This audio fireside is designed to take their mission preparations to the next level and ‘raise the bar’ in all aspects of their labors. “In many ways, preparing for a mission requires more discipline than a bobsled competition. Youth today need to have rock-solid testimonies, understand the doctrine and know how to follow the Spirit’s guidance in order to be effective in the Lord’s work. "The phrase 'Etiam si omnes, ego non' comes from the scripture Mathew 26:33 where Peter declares, 'Though all men shall be offended because of thee, yet will I never be offended.' It means that we will stand as witness of Christ in all time and in all places. "The Lord requires is a willing heart and mind. Young men and women who want to serve as champions of the Lord will have to dig deep and rely on faith to teach with power. This audio talk is designed to give them the tools and foundations necessary to develop their divine potential as missionaries and to inspire them to a deeper faith." Jeremy took his first bobsled ride at age 17 and has never looked back. During the ensuing years, Jeremy has continued in this fast-paced sport while also pursuing a degree in Print Journalism. He also served his mission to Honduras and Belize. Having spent time as the Head Coach for the U.S. Adaptive Bobsled Team and Athletic Director for the National Adaptive Sliding Sport Association, Jeremy continues his love for the ice as the pilot and team captain for Team Phoenix Bobsled. He has grown up surrounded by Olympic and world-class athletes and through these associations Jeremy has learned invaluable lessons which he often speaks on and teaches to a wide variety of audiences. Jeremy volunteers much of his time with other athletes where their influence can help support vital causes.